The TamaTown Tama-Go was the first (and last) of its series to be released. It was first released in the US in 2010. The Connection series was discontinued and this was the first released since the Music star in 2009. Originally only available in America and Canada, they were finally released in the United Kingdom 2 years later. I was lucky and managed to buy one when they were released in the states. The main difference between this version and the Music star is that this is intended to be a slimmed down version of the +color without the colored screen. It is intended to have TamaTown built in. 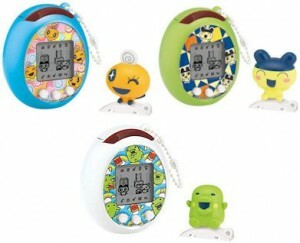 You can also collect and figures that attach at the top of the device and change the faceplate to customise your tama.